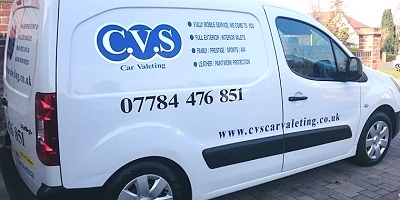 Established in 2003, CVS Car Valeting are based in Tilehurst on the West of Reading in Berkhire and are happy to work across Berkshire and south Oxfordshire. With some 13 years' experience in the mobile car-valeting industry, we offer full premium-quality exterior and interior vehicle valets, as well as specialising in tar removal, paintwork protection and spillage and stain removal. Our fully-trained team can valet your vehicle(s) at any location, whether it be at home, work or the gym. Each of our modern fleet of vehicles is equipped with state-of-the-art car-valeting equipment, and we offer a complete range of services to ensure your vehicle stays in tip-top, showroom condition. We operate six days a week and are happy to accomodate our business clients with an early morning start! CVS are fully insured up to £2,000,000 and have fully certificated and uniformed staff. Our commitment to excellence shines through in every aspect of our work for all of our customers! !